Thank you Line. I thought it was appropriate given the fact that yesterday was in the 50’s and today we’re expecting snow! Thank you Robin. Some animals do have expressions that look like human pouting and irritation! I have seen all kinds of funny ones. But I think it was more my irritation with this weather that put a spin on his story! hehe. Thanks for stopping by. Oh he definitely looks cranky and rightly so! thank you Sue! I went to Florida recently and then back to the midwest and bitter cold. it was quite a shock! Wish you all the best as you re-adjust from Jamaica. Exactly Maryse! hehe. Yes, the weather has been teasing us mercilessly. Thank you so much Dennis! Yes, you are right, birds take off at a moment’s notice. He was watching me very closely as I followed his every move across that log, while he was looking for some kind of sustenance. thank you Joshi. I feel the same way he does! Hopefully we just have 1 more week of winter. Can’t go wrong with Nature. Many thanx for sharing your photos and verse with us. Peace. thank you so much loujenhaxmyor! He’s a cutie, I hope he makes it. 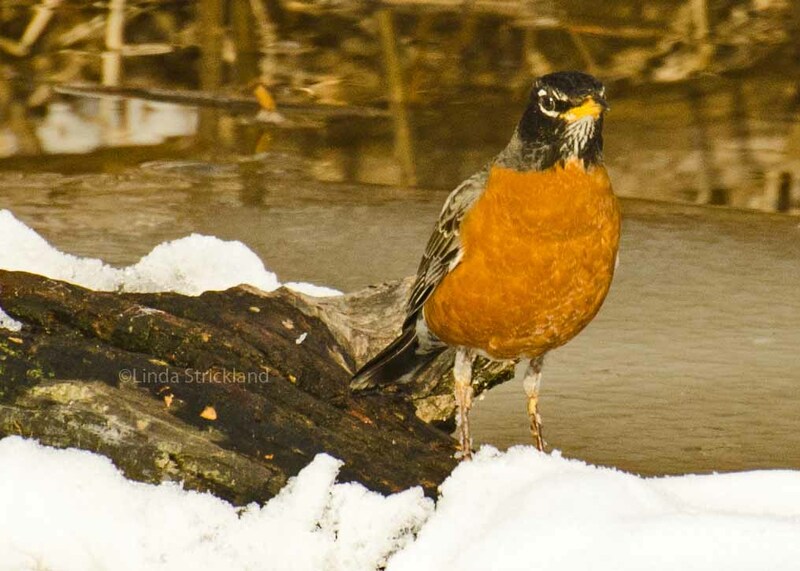 Robins are awesome survivors. They sure are Brenda! That’s what I love about them. Thanks so much for all your visits. It was fun catching up. I need to rely less on my reader, but I am afraid I will miss people if I stop using it… Sigh.